This year, as you all know, is an anniversary year for Taizé. Some of you already arrived Sunday and were able to participate in the prayer that we celebrated in memory of Brother Roger. August 16 was the anniversary of his death, ten years ago. And today, August 20, is another anniversary. Just 75 years ago today, Brother Roger arrived for the first time in this small village of Taizé in search of a house to create a community. It was during the war. Trains were not running well; he came on his bicycle. The men of the village were in the fields, harvesting. An elderly woman welcomed him for lunch. Realizing that he was looking for a house, she told him, “Stay here; we are so isolated.” He listened to the call of that poor woman and that’s how it all began. We are not only ones who remember that date of August 20. We learned with surprise that yesterday morning in Rome, Pope Francis spoke about it to the crowd gathered in St. Peter’s Square. On this occasion I would like to say: pray for Pope Francis; he gives so much hope to a great many people. In 1940, as the world war was raging, Brother Roger thought that creating a community of a few men would be a small sign of peace and reconciliation in a Europe torn by violence. The vocation he proposed to the brothers who were going to join him was to establish what he called a “parable of communion”, a “parable of community”. Brothers committed themselves with him one after the other until today. And the day after tomorrow, Saturday night, our brother Philip will say in his turn a yes to Christ to live his whole life in our community. Our brother Philip wants with us, his brothers, to continue to live out this parable of communion. This means giving a visible sign that Jesus, by coming to earth, inspired the beginning of a new humanity, where rivalry and violence no longer rule, but God’s peace. We are trying to achieve this sign with no pretensions, humbly, imperfectly. But there is happiness in giving our whole life for it, trusting in Christ. There is happiness in expressing by our community life that Christ has created a new solidarity between all human beings. For us brothers, it is a joy to come from different countries, different continents, and in this way to live a small sign of the unity of the human family. As it is also a joy for you to live for a week, on a small scale, a universal brotherhood. Committing ourselves for our entire life, as our brother Philip will do on Saturday evening, means setting out on a narrow and demanding path. We go forward to the extent that we rely not on our own strength but on the presence of the Holy Spirit. Not all are called to follow the same path as Brother Philip, of course, but God offers to each and every one of you the possibility to make a commitment through the gift of yourself. All these weeks in Taizé, we have been remembering that across the earth new catastrophes—displaced populations, environmental disasters, mass unemployment, violence—all this calls for new solidarities. Everyone can then ask themselves: am I willing to give my energies to allow these new solidarities to grow? Am I ready, without waiting, to begin with those around me? More and more local initiatives of sharing are emerging, for example with migrants. Migration will give a new face to our societies. The encounter between different cultures is frightening to some people. But as I repeated several times this summer, many more see globalization as a chance to realize universal friendship. So one question will become more and more imperative: is it not essential to set up supranational bodies, and even a kind of universal authority, which would lay down rules to ensure greater justice and to maintain peace? The brief text you received on your arrival, “Taizé 2015,” shows how we will move forward in the next three years. Three words that for Brother Roger expressed the spirit of the Beatitudes will guide us: joy, simplicity, and mercy. For the coming year it will be that simple word "mercy". We all seek together to discover how God’s compassion, God’s unconditional love, is the source of compassion between people, the source of new solidarities that each one of us wants to live out in our daily lives. Beginning today, you can see near the bells a gallery of portraits of young people from around the world who are expressing their vision of new solidarity. This exhibition was designed by young people who were willing to share what solidarity means to them. Now I would like to give the floor to Jirina, from India, who has been here as a volunteer for three months. But first, I extend a greeting to the young Africans gathered at Tlemcen in Algeria. For ten years, every summer, young people have been organizing two weeks of meetings with the same topics as at Taizé. We feel so close to these young Africans. My name is Jirina. I come from Assam, India. I belong to Boro tribe. We are farmers and not educated. Most of my people are alcoholic and do not give much importance towards education, especially girls. My father was also alcoholic; it was my mother who supported me in everything. By the Grace of God, I am the first girl in my village, who could finish a bachelor’s degree. I too faced all kinds of struggle in my life. The struggles of my young people motivated me a lot to complete my studies. Now I am studying theology. I want to serve God and my people, especially to uplift the women in my village. And also want to bring back the young people to believe and have faith in God. 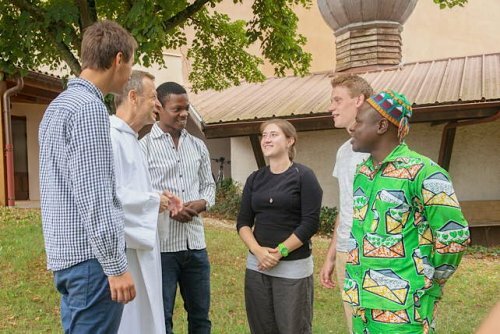 The experience in Taizé gave a new ways of understanding and dealing with young people and to be focused towards my commitment. Thank you Taizé!